Welcome to the St. Andrews Golf and Country Club! Book your tee time now online or call (770) 489-2200. St. Andrews Golf and Country Club is an Atlanta golf facility that features 6,629 yards of fairways, sandtraps, water hazards and greens just outside of Atlanta in Winston, Georgia. The course gives the golfer a feeling that can't be found anywhere else in the the area. Rated one of the Top Ten golf courses in Georgia, our professional staff is dedicated to creating an enjoyable experience for every guest. Whether you are enjoying the pace of play on our beautifully maintained, tree-lined Atlanta golf course or networking with other professionals, you will surely find that St. Andrews Golf and Country Club offers an experience like no other in the Atlanta golf area. St. Andrews has an eager staff that is committed to providing you with customer service that will make your golf visit memorable. Enjoy our facilities secure in the knowledge that you will always be greeted with a smile and have an enjoyable experience out on the course. In combination with the simple beauty of St. Andrews, guests at your next golf outing are sure to remark on how much they enjoyed their time. Beyond great golf, we also offer excellent dining options through various providers in the area. Make your best impression year after year as you entertain family, friends, or clients in style and comfort at St. Andrews. 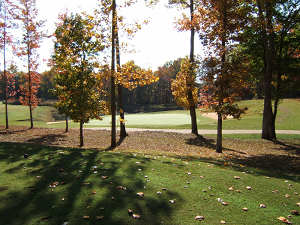 The par 72 course features Bermuda fairways and Bentgrass greens which are maintained under the direct supervision of Heath Hammond, one of Georgia's most talented superintendents. The terrain and layout of St. Andrews, along with its 5-tee box selection, can challenge the skill of the beginner or the accomplished golfer. The front nine challenges a golfer's ability to control their shots as it weaves through the neighborhood, while the wide open spaces and natural setting of the back nine provides a relaxing atmosphere where you can open up your game and go for your best drive. The difference between the front and back will make you believe you played on two different Atlanta golf courses. The course is supported by an excellent practice area that includes a chipping and sand trap green, Bentgrass putting green, and a two-tiered practice range. With outstanding natural resources and diverse topography available, the course at St. Andrews is a preferred golf venue for corporate, civic, and charitable outings.